It’s that iconic face. Those cheekbones, those lips, that pout. And that blonde hair. 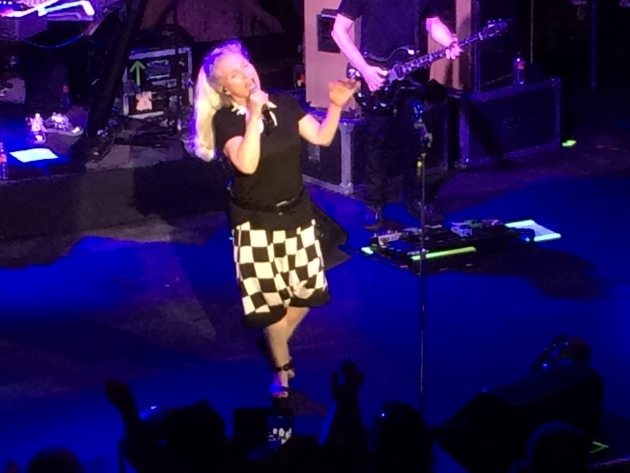 At 70, Debbie Harry is still believable leading Blondie, which put on an entertaining, feel-good show Saturday night at the Minnesota Zoo. With original members Chris Stein on guitar and Clem Burke on drums along with three other (younger) players, Blondie sounded terrific. Sporting a black-and-white outfit and a long blonde fall, Harry still has that girlish voice when she needs it and a new-wave siren sound when she wants it. She didn’t really summon much passion until the second-half of the 90-minute set. The turning point was the dark, disco-y “Rapture” (from 1981) with her faux hip-hop moves and rap that segued into Prince’s “Kiss,” punctuated with Harry smacking those perfectly shaped lips before sexily spitting out the title word. Harry loosened up in the home stretch, doing a little salsa dancing during “Sugar on the Side,” a 2013 tune Latin-flavored EDM groove number that Stein wrote with some Columbian musicians (yes, Blondie is still making new music). She had fun on the Misfits’ punkish “Hollywood Babylon” and Blondie’s own 1977 tune “Rip Her To Shreds,” which suggested the Ramones on Quaaludes and found her doing a mock Mick Jagger dance. For the finale, 1979’s “Dreaming,” Harry and 1,500 fans were floating, riding those new-wave rhythms that landed Blondie in the Rock and Roll Hall of Fame.